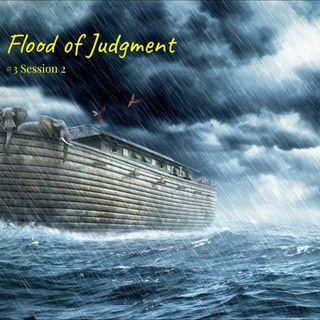 In the next three sessions, we will look at the Second Day of Creation, beginning here with the flood of judgment. If the First Day of Creation is a picture of how we are in darkness, being separated from the light of the glory of God because of our sin, then the Second Day reveals firstly how we stand under judgment by a holy and righteous God. Sin demands a price, which must be paid, and this price is death. We see this fulfilled in the ... See More Great Flood, the first worldwide judgment, which we can read about in Genesis 6-8. In order to better understand how this event could happen, remember in Gen 1:2, we were told how the world was formless, empty and dark in the beginning, and that the Spirit of God was hovering over the waters. The Bible tells us that the world was initially covered in water, for it was only on the Second Day that part of this water was separated out and lifted up into the atmosphere, and the Third Day that dry ground first appeared when the remaining waters were gathered, probably in the deepest parts of the earth. The flood came about when God released all these waters stored above the sky and underneath the earth back onto the world. For those of you who doubt whether the flood really happened, there are over 270 accounts of this global catastrophe from people groups and cultures all over the world. It is sobering to note that 1656 years passed from the time of Adam until the Flood. During this time, only 8 (Noah’s family) survived out of the possible 3-7 billion people that lived then. Noah’s father Lamech was 56 when Adam died at age 930, meaning that most of mankind would have heard first-hand from Adam about God, yet they still turned to evil. Imagine how heart-wrenching it was for Adam but even more so for God! You would also recall that following the Fall, God promised Adam and Eve in Gen 3:15 an offspring who would crush Satan’s head and so redeem mankind. They must have harboured this hope when Cain - literally the first “son of man” - was born. But instead of crushing Satan, Cain murdered his own brother, Abel. We are just so utterly sinful, unable to rescue ourselves. Only God Himself - when He came to us as Jesus the True “Son of Man” - is able to accomplish this - to crush Satan and cover the nakedness and shame of our sins.